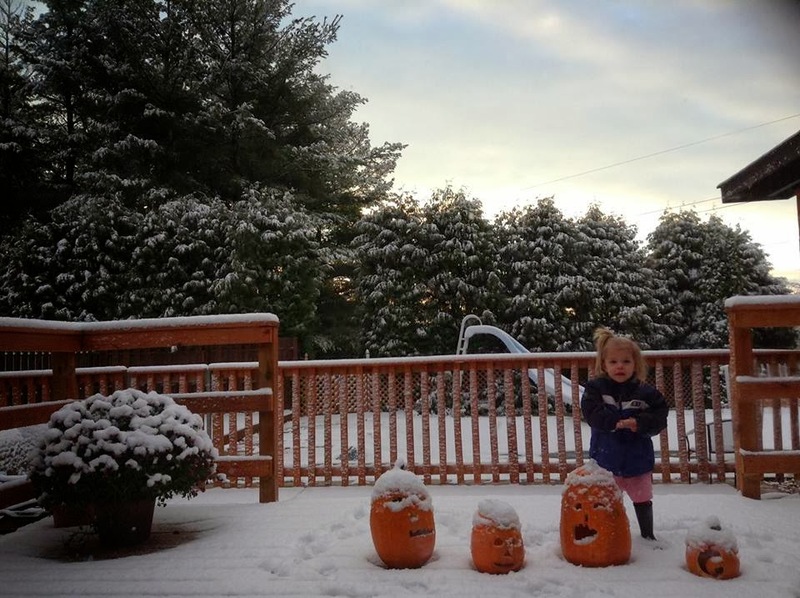 Last night we received a dusting of snow. I woke up in the middle of the night and could see the giant pine trees being iced gently with white. 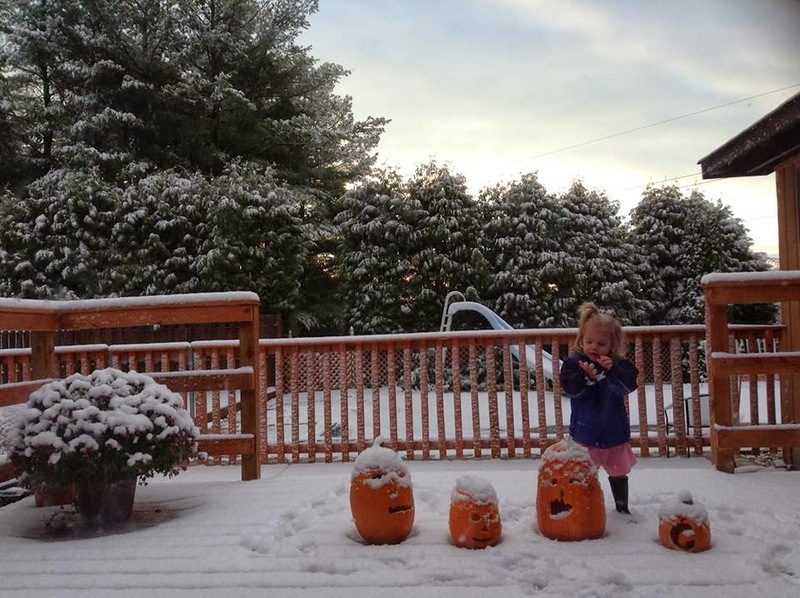 My four year old wandered bare foot into the kitchen at 6.37 a.m. this morning, he looked wide eyed out at the snow. “Mom” he said in total seriousness. “I think I have to go outside right now.” I told him to do what he needed to do. Because if you ever feel as if you need to be out in creation right now- this second- you should be. So he put on his shoes and put his hands in his pockets and walked around our yard. Touching the snow with his bare hand. Kicking it with his sneakered feet. He gazed at the cornfield and looked for deer. He was completely content in the now. It wasn’t until his ears were icy and his cheeks were red that he came up towards the garage. And then his sister woke up. Only two, she told me that she had to go outside right now. And even if you’re two, if you need to be outside in creation, then you should be. So I put on her boots, with her bare knees popping out under her pink pajama shorts. 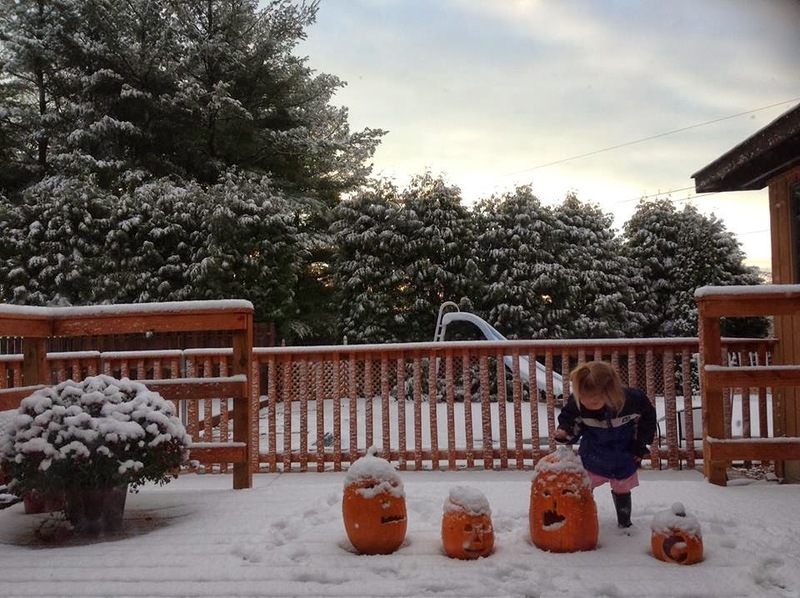 I gave her a coat and delighted she walked to our pumpkins and brushed off their snow hats. The sun was just peeking around the pine trees. Be Outside. We try to tell our children. Be Outside – we try to model for our children. And when you’re outside, you don’t always need to play or work or be productive. Just be there. Wander. Touch. Listen. Know that as important as you are, you are a piece of something bigger. And our hope is that our kids will feel the exhilaration and adrenaline and peace that only the wild breath of nature brings. You cannot control this, we tell them as rain pounds on our tent. There is no button for this, we show them rushing rivers. This took thousands of years – we show them the curve of canyons and take their tiny hands to run sand through their fingers. Thousands of years- We point to the sky and tell them that is how far away the stars are. Tiny insects, are right here. Hold them gently. Protect them. Play under the trees and under the sky. In the snow, take off your mittens, feel the cold explode your lungs when you run and the heat warm your face and the earth wet your feet. Every day. Do this every day. There is something that makes us grow in an environment we can’t control. And maybe if we can learn to adapt in nature, we can learn to adapt in life. Maybe if we realize at a young age that the only variable we can truly change is ourselves, then we’ll focus on changing ourselves. So don’t wear a coat. Be cold. And next time- wear your coat. I circle around my kids putting a ridiculous numbers of layers on, answering their cries and protests in a rhythmic manner. I know. You don’t want to go outside. I know. I put on their boots. I know. It’s cold. I put on their hats. I know. Legos are so much fun. I hand them mittens. I know. I know. It’s boring. It’s so boring. I push their little bodies out the door. And some days I lead myself in an equal conversation as we corral them up and over hills. I know. This sled is heavy. They’re so whiny. They’re so little. It’s so cold. But the bottom line is this: It is worth it. You are a piece of something bigger. There is beauty all around you. We tell our children as we shelp them to lakes, and push them outside, and lay quietly with our feet in the grass and our backs pressed into the earth, our arms circling our beloveds looking at the sky.